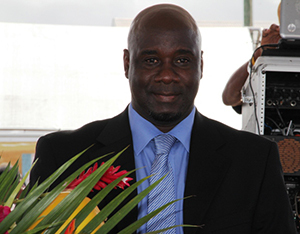 NIA CHARLESTOWN NEVIS (November 17, 2014) — The following is the full text of a speech delivered by Minister of Natural Resources and Environment in the Nevis Island Administration (NIA) Hon. Alexis Jeffers on November 16, 2014, on the occasion of CARICOM Energy Week 2014. It is an honour to address you at the beginning of what is dubbed CARICOM Energy Week 2014. Every year in the month of November, the Caribbean Community [CARICOM] Secretariat located in Guyana, takes time out with member states to highlight issues related to energy, its use and linkages with various sectors and the environment. All of us will agree, that there is a direct connection with climate change, economic development and energy security. The increase in energy usage, coupled with an increase in the emissions of greenhouse gases, especially from the use of fossil fuels, will have severe impacts on the natural environment and the global climate. Therefore, rising sea levels, changing rainfall patterns and increasing incidence of droughts, destructive storms such as hurricanes, floods and heat waves will affect ecosystems, food production, water resources and of course, energy production itself; and I dare say our very survival. As such, those of us in the small island developing states of the Caribbean, are especially vulnerable and it therefore calls for an urgent and proactive response in order to secure generations to come. That is why when we reflect on the theme for this year’s CARICOM Energy Week 2014, we must conclude that it is most appropriate and timely. If we do not adapt, adjust and respond to these realities, then our economies will suffer and there will be an increase in the poverty levels in these small vulnerable economies. Over the past six years or more, the small developing states of the Caribbean economies have struggled with the rising cost of fossil fuel and energy generation. To this end, we are seeing steady progress in the approach in the development of Renewable Energy Projects. There has been a renewed interest in Renewable and what they mean to us as developing states. In fact, we are also seeing the establishment of real renewable energy projects. The nature of the dialogue and action has changed, as the urgency to recognize that there is a window of opportunity which we must capitalize on, if we are to realize our goal of a 100 percent green economy. It has been shown worldwide, that there is a link between economic growth and the pursuit of renewable and sustainable energy investments and development. That is why the Nevis Island Administration, through the Ministry of Natural Resources and Environment, has taken bold and deliberate steps to establish the right energy mix, so as to diversify its energy portfolio. This ultimately will bring relief to the residents and people of Nevis, in terms of making electricity cost more affordable while at the same time, reduce our emission of greenhouse gases and secure a reliable supply of energy. The areas of focus for the NIA will bring macroeconomic benefits such as increased employment and income as well as foreign direct investment. Moreover, these areas will ensure sustainable energy development, since we are using natural resources which are available in abundance and cannot be depleted if harnessed properly. Wind Energy: we have already in place a wind farm which can generate up to 2.2 Mega Watts of power to NEVLEC [Nevis Electricity Company Ltd.]. Geothermal Energy: we have been successful in removing the legal impediments to the development of this project and have signed an agreement with a reputable and experienced group of experts which established a company called the Nevis Renewable Energy International LLC, for the development of the geothermal resources here on Nevis and to build a 10 Mega Watt power plant. Waste to Energy: in collaboration with the Ministry of Health and the Solid Waste Management Authority, the NIA has signed an agreement with Omni Alpha to convert our waste into useful energy for NEVLEC to distribute to its customers. This will serve to deal with our solid waste problem while at the same time, produce additional power to the electricity grid. Solar Energy: In addition to the waste to energy plant, a solar farm will be established to compliment the energy mix by the same company Omni Alpha. Note also, that a number of private home owners and businesses already have solar energy installed as part of their energy mix, to save and conserve their energy usage. Speech by Minister with responsible for Energy to mark the commencement of the week’s activities. A Photograph Competition – Students will be encouraged to submit photographs centred around Renewable Energy (RE), Energy Efficiency (EE) and Energy Conservation (EC) for uploading on a Face Book Page – under the sub-theme: “Energy Sustainability for Nevis”. Prizes will be awarded. Online Energy Quiz – Students will be encouraged to participate in an online Energy Quiz. Prizes will be awarded. An Exhibition in the War Memorial Square in Charlestown, on Friday 21 November: This will showcase Energy information material, tokens and light refreshments will be distributed. Essay Competition at the Primary and Secondary School levels; again prizes will be awarded. 1st Place will receive a Tablet, the other winners will receive cash consolation prizes. Presentations are to be made to secondary school students by NEVLEC representatives, along with the distribution of energy-related material and tokens. We are confident that the proposed CARICOM Energy Week 2014 activities will go a long way in building energy awareness, especially with respect to Renewable Energy, Energy Efficiency and Energy Conservation among our students, business owners and the wider community on a whole. I now take this opportunity to thank NEVLEC, the Ministry of Natural Resources and Environment and the CARICOM Secretariat for this week’s activities and wish the CARICOM Energy Week 2014 every success, as I now declare the week open.